Tallinn: The Former Soviet City That Gave Birth To Skype : Parallels The Estonian capital is dotted with medieval towers and Soviet architecture that belie its status as one of the world's most technologically advanced cities. Residents use a smart card to ride the bus, and mail packages and pay for parking with their phones. The old town area of Tallinn, Estonia, is dotted with medieval buildings that reflect its long history. But the city has placed great emphasis on high-tech since the country broke away from the Soviet Union two decades ago. The Baltic city of Tallinn hardly looks modern with its blend of medieval towers and Soviet-era architecture. Smoke-spewing buses and noisy streetcars look as if they have been plucked from the past. Even so, the Estonian capital is one of the world's most technologically advanced cities. The birthplace of Skype has repeatedly been cited for its digital accomplishments. Last week, Tallinn once again made the short list of the world's most intelligent cities as selected by the Intelligent Community Forum. 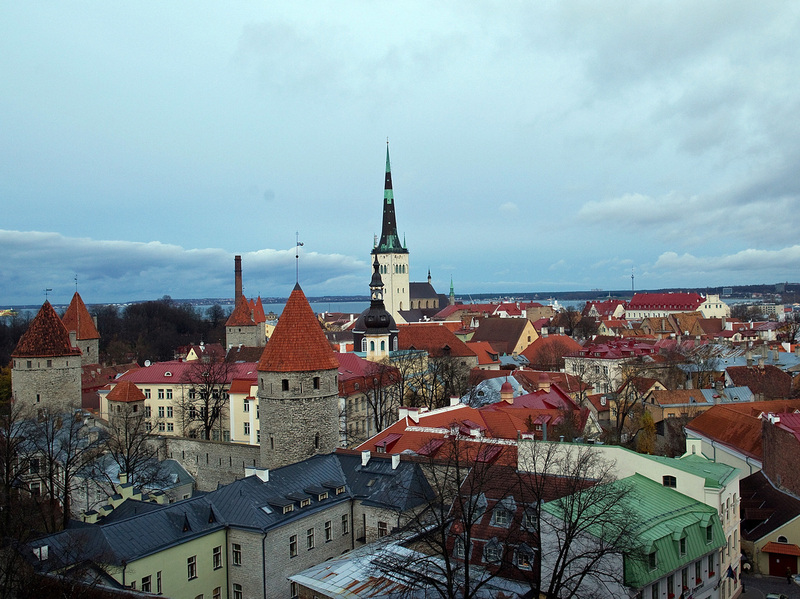 Tallinn residents depend on the Internet for just about everything, and automation is the rule. Riding the bus is free but requires a "smart card" that you wave over an onboard sensor pad that allows central transit authorities to track your movements. Mailing a package requires a sender to use his or her cellphone to request a code from the electronic post office downtown. The code opens a locker to start the package on its journey. City parking is another digital adventure. Journalist Gustaf Antell says it starts with a text message to an electronic parking authority. "I think everybody in the city knows the number to the parking service: 1, 9, 0, 2," he explains. "Then I put my car's number, and then I also write the code" for the parking lot. The fee appears on his monthly cellphone bill, which he pays electronically. Estonians are also required to carry chip-embedded identification cards. Without the card, residents don't officially exist in Estonia. The cards are used for voting, prescriptions and most other transactions, all done online. Many Estonians appear to embrace their digital dependence. It's a trend that began after Estonia broke away from the Soviet Union two decades ago. Officials say they had to create an "e-government." 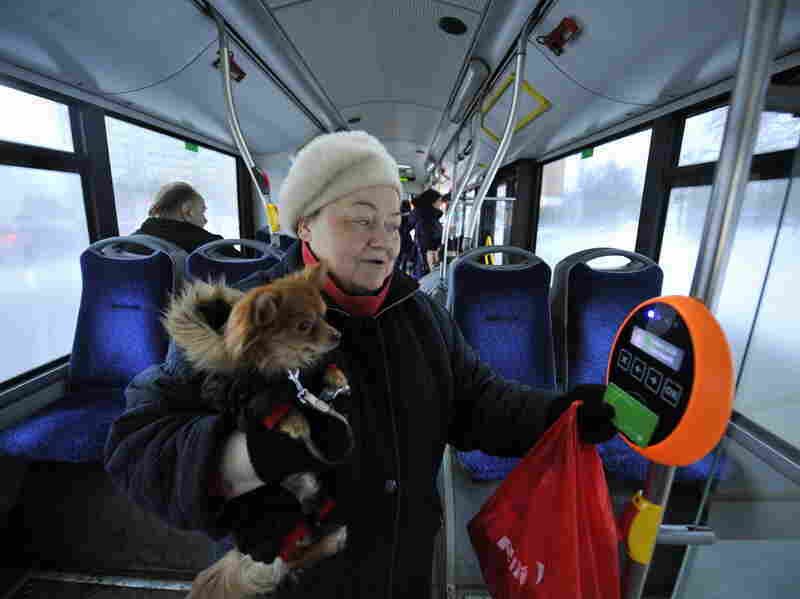 Residents of the Estonian capital of Tallinn can use public transportation for free after purchasing a special card for 2 euros. "We are a small nation, and at the same time we have to develop a government that has same functionality as the big countries," explains Jaan Priisalu, who is director general of the Estonian Information Systems Authority, which has the task of protecting the country's Internet infrastructure. He adds that with a population of about 1.4 million, there simply aren't enough Estonians to run things. Growing private sector Internet and communication technology is a priority in Estonia. Near the Tallinn airport is Technopolis, the city's version of Silicon Valley. Scores of Estonian businesses there introduce the latest in high-tech services and gadgets to visitors from Estonia and abroad. One recent favorite is ideal for those with a brown thumb. It's called Click&Grow, says Anna Piperal, who manages the ICT Demo Center at Technopolis. "It's a plastic box, which looks something like a Mac product," which comes with seeds, two AA batteries and a microchip, she says. "So once every two months, you are putting water inside, and the chip is so smart that it feeds and grows the plants exactly according to the plants' needs." All the owner has to do is put the box somewhere in the sunlight, Piperal adds. A 20-minute drive from Technopolis, Estonian teachers and families flock to a tech fair that features state-of-the-art educational tools. Young Estonians learn that even tradesmen must become computer literate and tech savvy. One item on display is a programmable milling machine, which carves wood based on what students draw on an attached computer screen. The machine is already in use at a fifth of the country's schools. Educational technologist Ingrid Maadvere says educators hope to eventually replace textbooks with electronic tablets now that so much teaching and homework is done online. "We have one joke in Estonia: that Internet connection is one of the human rights," she says. But it's a right not afforded to everyone in Tallinn, especially the poor. One of them is Valere Kalinin, who is part of Estonia's Russian-speaking minority. The 50-year-old unemployed laborer lives in two cramped rooms with his wife and two teenage sons in the sprawling Kopli neighborhood of the capital. When asked about the importance of Internet to his family, Kalinin laughs. "I have real problems like finding work and money for food," he says. "This is not for me, this Internet." He adds that he can't afford electricity, let alone Internet, though a junction box from the local provider is attached to the wall outside his crumbling flat. The family lives without power for months at a time. Kalinin's problems are not unique, says Mati Sinisaar, an Estonian pastor who works with the unemployed man's sons and other needy Russian children. "I was asking these young people why they are out of school. I asked what is the main reason you feel you are more poor than your friends in school?" he recalled. "I was waiting that maybe they say because of bad shoes, maybe bad clothes, maybe not enough food. They say that they drop out of society because they don't have Internet connection at home." Even so, it's Russians here and abroad who are accused of carrying out the worst cyberattacks in Estonian history. The attacks that began in late April 2007 were in response to the Estonian government uprooting a Soviet-era statue called the Bronze Soldier and moving it across town. Ethnic Russians in Tallinn were angry because they weren't consulted about the move. They saw it as yet another slap by the Estonian majority, which has marginalized them since gaining independence. The attacks forced the government, banks and businesses to shut down their websites. Organizers also used mass text messaging to get protesters out to snarl traffic. Some accused the Russian government of masterminding the attacks, which it denied. But Russia refused to cooperate with any outside investigation. In the end, a single ethnic Russian was convicted for taking part in the cyberattacks. He confessed and was fined $1,500. The attacks had Estonia scrambling to better protect its Internet infrastructure from future attacks. The country now hosts routine cyberattack drills in which government and private sector participants learn to spot and stop phishing attempts and viruses. "We have intrusion detection systems, we have firewalls, we have had more exercises, we have done more trainings together with the government, with public sector, with private sector, so yeah, we are better prepared today," says Aivo Koger, a security expert at the country's largest Internet provider, Elion. Estonian officials also persuaded NATO to set up a Cooperative Cyber Defense Center of Excellence in Tallinn. International lawyers there recently completed the "Tallinn Manual," the world's first comprehensive guide on legally tackling cyberwarfare.